Did you know that the Crockett County Museum used to be a hospital? Well, it did, and on March 28, we met one of the last patients in the building…her sister Susan share’s their story, enjoy! “When we first moved to Ozona, every year the First Baptist Church gave a dinner for the new teachers. In Sept. 1956, the dinner was just beginning and Dr. Ralph Simon was preparing to play his violin. He got a call and had to leave to go deliver Peggy. She and Mama were the last patients in the old hospital that is now the museum. Most of the furnishings, etc. for the hospital had been moved out and much of the furnishings for the sheriff’s dept. had been moved in. My daddy used to love to tell people that my sister was born in the sheriff’s office. 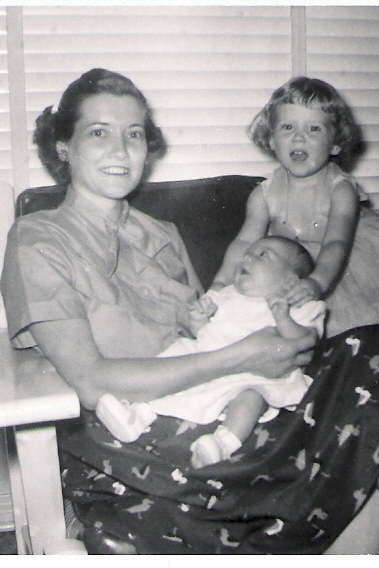 Pictures used by permission from Susan Black: Picture above left shows Mom (Ona Faye Black) and daughter (Peggy) with big sis( Susan) looking over. Picture to the right shows Peggy in front of the museum in March 2013. Great story Susan, thanks for sharing! Do you have a story you would like to submit? Email us or call our office.